The main aim of this LUCID HD7 review is to satisfy the curiosity of many prospective buyers that are left scratching their heads after laying eyes on this sight. The budding shooter or growing gun enthusiast will be walked through some of the LUCID’s features and functionality, with a view of highlighting exactly what it can do when one takes the time to look beyond what can be some very intimidating looks. If the manufacturers were aiming to win any functional design awards with this sight, they should go back to the drawing board. This LUCID HD’s physical appearance sports a very bizarre combination of colors (the tan-colored version), with about four different colors clearly visible to the eye (dual-colored lens, a different color for the lens housing and knobs with a color that matches the mount rail). Considering the type of firearms you’d typically use this 13 ounce baby with though, you wouldn’t give two hoots about whether you stick out or not. What you want is performance, so what does the LUCID HD7 Generation 3 Red Dot Sight give you in deployment? Surprisingly, this beast of a sight only uses one AAA battery and just by looking at it you can see that it was designed for strength. It falls within the budget price range (under $200), but it genuinely looks like it can take a whole lot of battering and bruising — when holding it in your hands, you get the sense that you can really put it through its paces and it’ll hold up perfectly. Who is this sight for? Surprisingly enough (yes, another surprise), the tan LUCID HD7’s color is useful in just one type of environment, when you’re lying flat on the ground, ambush-soldier style, in the dirt or mud and surrounded by some wild shrubbery. In this environment, the sight almost disappears and that’s how well it blends into the background. Otherwise you can get it in black as well. If you’re shooting with a Smith & Wesson M&P 15-.22 (semi-automatic rifle) though, which seems to be one of the firearms this sight was specifically built-for, you’d never really need to hide — certainly not in a flat position surrounded by thick flora. 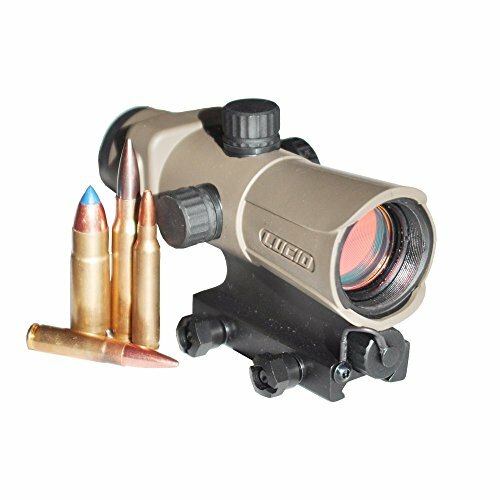 This is more of a red-dot sight for shooters who have a real and growing passion for shooting and gun enthusiasts who are keen to openly display their passion. It’s probably not for any serious professionals though, so race-gun shooters and the like would probably find this quite a bizarre sight. What are the mounting options? The Picatinny rail mount featured is built-in, which would obviously limit the mounting options to guns such as ARs, but this gives it a very robust and durable build which is reinforced by the cast-style aluminum finish. It’s armored with rubber as well, so a budding shooter won’t do much damage to it considering how many times you might just drop it. We admittedly harbored our own doubts about this sight, but in-deployment it does quite well. The optic delivers reliable performance and is perhaps the best-looking part of the sight. In fact, average industry standards are exceeded slightly, such as the auto-brightness feature which is probably the only one we’ve come across that actually works well. Reticle performance (in terms of holding zero) seems to vary a little though and we can’t quite put our finger on what the varying factor could really be. We got wind of a separately sold 2x screw-in magnifier that can be used with the HD7, but if you’re going to spend a little bit more and effectively move out of the budget-price range, you’re becoming a little bit more than a casual enthusiast. 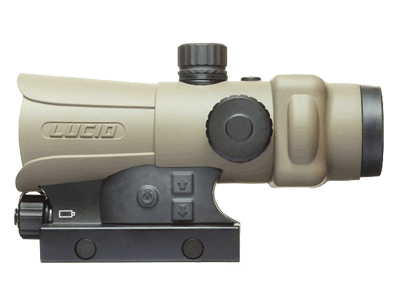 The Bushnell Trophy TRS-25 Red Dot Sight Riflescope would probably make for a better option either way, especially since it’s about half the price of the LUCID HD7. See how it compares with other sights from our best red dot sights list. The budding and passionate shooter or firearm enthusiast would otherwise probably have not entertained the prospect of buying this sight if they didn’t come across this LUCID HD7 review first. The sight boasts a little bit of an unusual physical appearance and the built-in rails might raise a few eyebrows, but in action it beats a lot of industry standards, particularly with regards to its optic’s reliability.